← I’ve Definitely Been Challenged! I haven’t done much other than make meat pies for the farmers market the last week. It seems with cooler weather people want comfort food. So many Steak and Mushroom pies and Tourtiere pies have been made. I did finish my Guild poker challenge I told you about here: spinning-for-the-guild-challenge/ The beads really were not inserted very well and that showed up more in the plying but here it is finished. You can see how the locks aren’t in well enough so they are very loose in the ply. 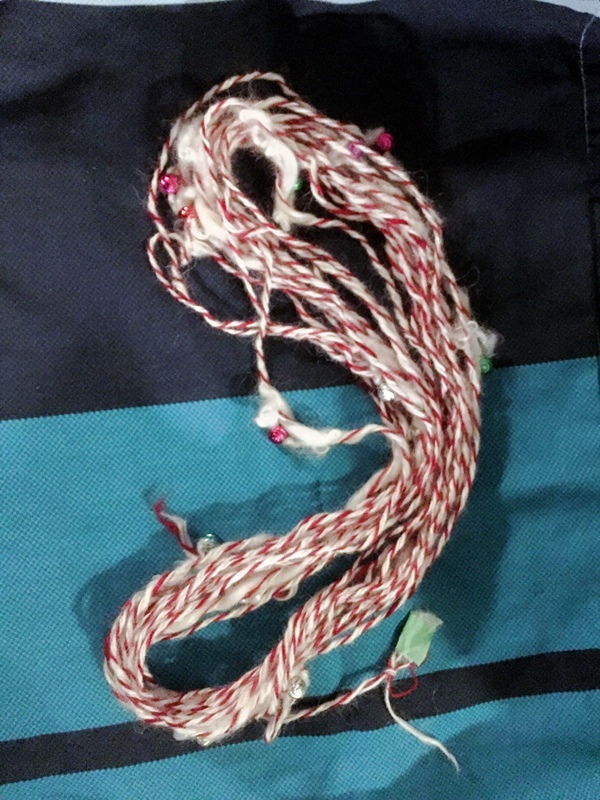 I learned a lot and I think next time I will ply with a thread with beads on it instead or maybe do some sort of core spun yarn with a beaded thread. I have also been spinning on my spindle. I can do that anywhere. They are both thick and thin yarns. It will show more after they are plied. 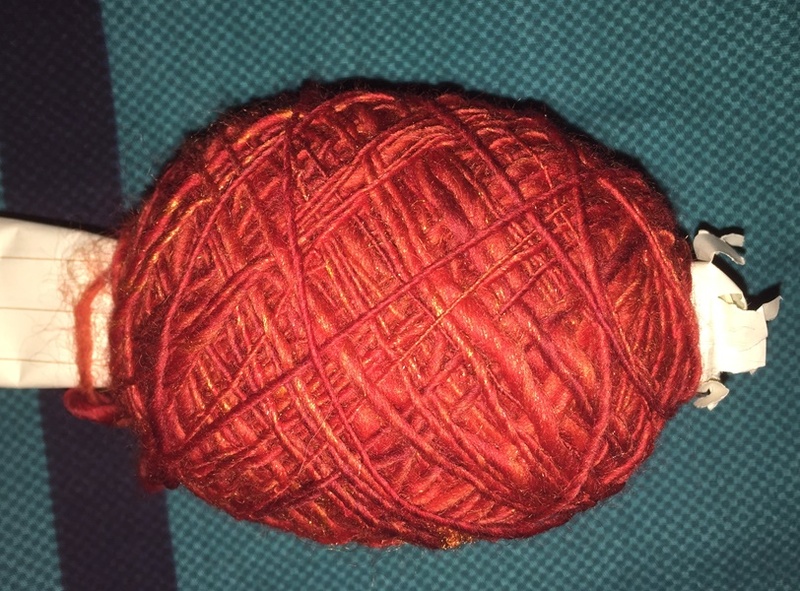 I finished this, it’s reds with gold super bright trilobal nylon I dyed. I don’t remember what colour I used to get it, maybe aztec gold. The first picture shows the colour best. The second picture is over exposed, so hopefully you can see how much sparkle is in it. 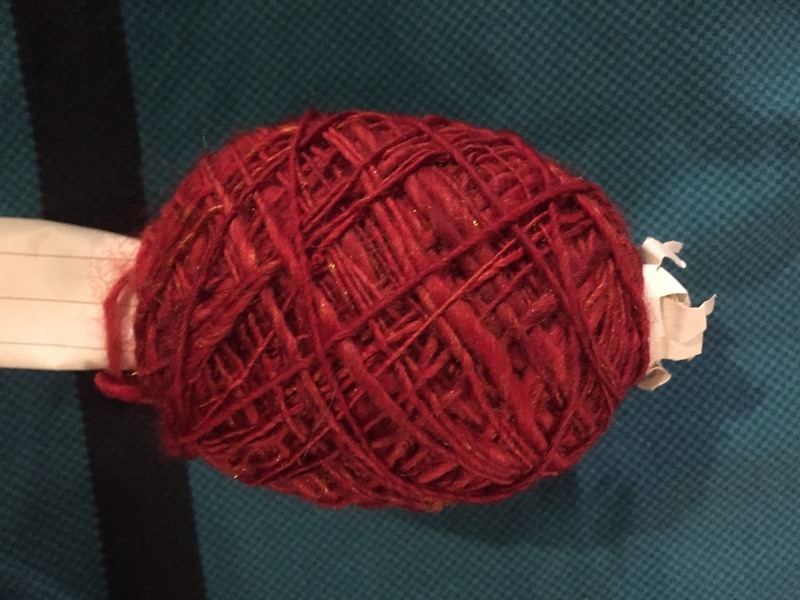 My current spinning project is also red but it has pink mixed in and white silk and undyed supper bright trylobal nylon. After this spindle is full I will decide if I want to play them together or keep them separate. Later they will make their way into some felting. 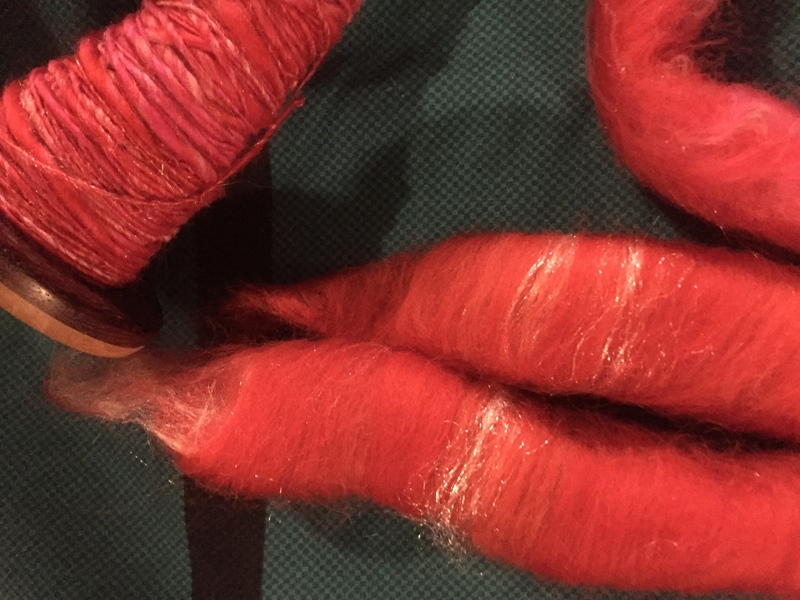 What have made to use later in your felting? 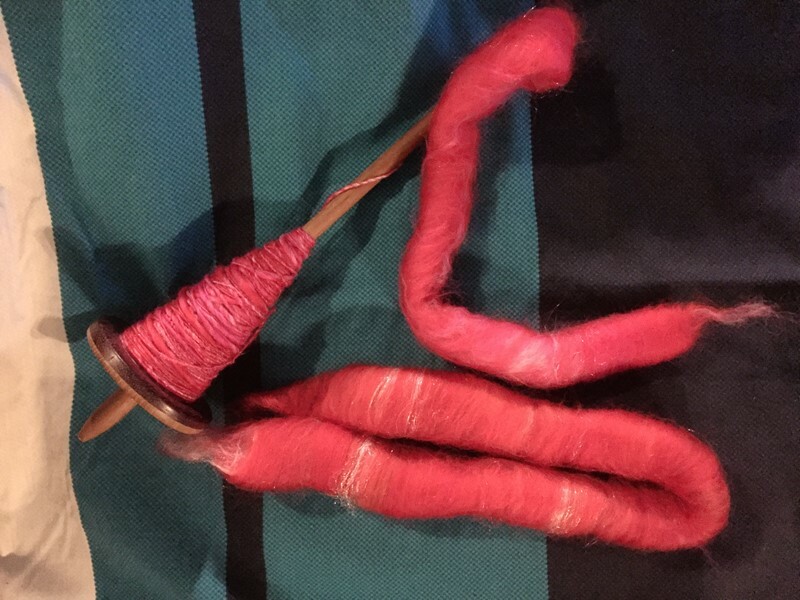 This entry was posted in Beading, Challenges, Spinning, Uncategorized and tagged spindle spinning, spinning. Bookmark the permalink. I really, really fancy a meat pie now! 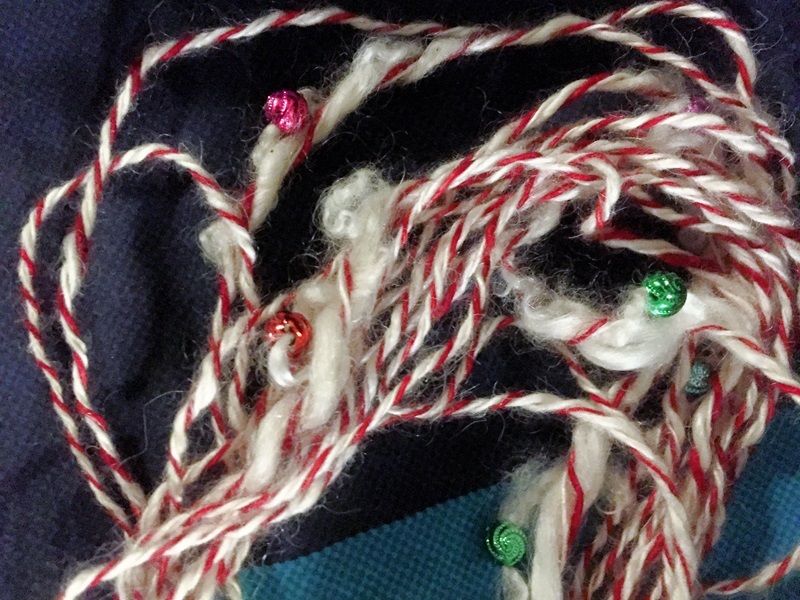 The close-up of your beaded yarn looks very Christmassy – there must be a way of using it in the next few months? Your hand spinning is impressive – I like the red but I love the pink! Thanks Lyn. our weather has now decided to turn back to summer and be very hot so pie is not on the menu for me. I forgot to say they are both thick and thin yarns. I think I will edit it to say that. I may ply them at a demo this weekend. Thanks. weaving may let you pop them to the surface. Unless the beads age huge like the ones I used they tend to get lost in the wool and you really have to look for them to see them. I don’t want to cook pie now. our summer finally arrived 2 months late but we will be up to 30c this weekend. I think BBQ is more in order. Those beads do look tricky. I know even crocheting with beads it’s a lot of concentration. I do like the sparkly red and pink yarn. Will you make something with it or sell as is?. yes beads are a problem. I will figure it out eventually but there are some other things I need to do and some I want to do first. I may wind some off to sell but I will probably use most of it in my felting. I decided to do red because I didn’t have much red. I am going to make some more rollags this weekend at a demo but I haven’t figured out what colours yet. Sounds like you’re staying busy. It’s been pretty cold here so meat pies sound good. I’ve made tubes, tubes, and more tubes! I’ve raided my knitting needles to make larger ones than the kebab skewer makes! Sometimes the preparation (carding, blending, spinning etc) is as much fun as the actual project isn’t it? I like your yarns the colours are really nice. Do you find the trilobal nylon everywhere after using? The blending board is fun. I really like spinning with the rollags. I keep a very tight control of the sparkly.